“Russians love vodka” is the most common stereotype known by foreigners. However, there are other most likeable things for Russian people. After reading about personality traits of Russians, you might wonder what are the things Russians like and enjoy. Read this article to find out more! Russians do not really celebrate Christmas. They do, however, celebrate New Years! Russians respect religious holidays but their favorites are the non-religious ones such as New Year and Victory Day. Russians celebrate New Year with alcohol, food, chocolate, lots of dancing, and fireworks. Also, for New Years, children get gifts just like they do for Christmas. These gifts are given by Ded Moroz (Old Man Frost) and Snegurochka, his assitant. Ded Moroz comes in through the door while the children are sleeping and delivers their presents. Popular food to celebrate the New Years are: potato salad, potato bread, pickled mushrooms, roasted meat, tomato salad, smoked fish, layers of cakes, and vodkas. These food are placed on the table and family and friends will gather around it. They will then enjoy themselves until midnight and when the clock strikes twelve and the year changes, they toast, drink, and wish each other good health and fortunes. Russians definitely love their tea. The Russian tea time can occur at any moment; morning, noon, or just after dinner. 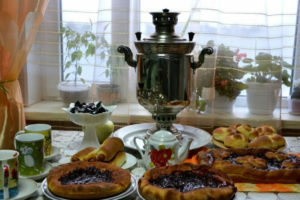 Tea is served together with a jam, syrup, cakes, cookies, candies, chocolates, cheese sandwiches, and other kinds of sweets. The most loved teas in Russia are the black tea and more recently, green tea and herbal tea. The most popular black tea is Assam, grown in Asssam, India. Meanwhile, herbal teas are making its rounds due to its claim of helping weight-loss. During tea time, if the tea served is too strong, you can add hot water to your cup. If the tea is too hot, you can pour the tea onto the saucer, and then sip it. Pouring the tea onto the saucer is how most Russians drink it. Additionally, the tea is often consumed “black” but adding sugar and milk is permissible for those who wants a sweeter drink. A traditional drink known as black bread in Russia, the Kvass is commonly made from rye using fermentation. It is a non-alcoholic drink according to Russian standards (low alcohol content). Optional flavors of Kvas are strawberries, mints, raisins, or other kinds of herbs. The way it’s made is: the bread is toasted until darkened, then placed in sugary water. The liquid then is mixed with yeast. Afterwards, it is left for a couple of days before strained. Drinking Kvass is part of the Russian culture for thousands of years. Kvass has been used for multiple things, from medicines to foods like a cold soup. Nowadays, Kvass comes bottled and are available everywhere. However, the quality of bottled Kvass cannot compare to a homemade one. A unique trait of Russians, most of them are highly knowledgeable when it comes to mushroom picking. Since childhood, they have been taught about the know-hows about mushroom picking. They can discern edible ones from the non edibles ones and they know just where to find it. Even though in modern days, you can buy a mushroom from the market, mushroom picking is still an activity done once in a while by those with access to a nearby forest. Many types of dish uses mushrooms and they can be cooked in any way possible. The mushrooms most people sought after are white mushrooms, porcini, birch bolete, red-capped bolete, chanterelle, slippery jack, and many more. A walk is one of Russians’ favourite pastime activity. Going on walks with your friends through the bustling cities is an enjoyment for most Russians. They go to the parks for a stroll, participate in some activities like yoga classes, buy some ice cream, or just take a breather. There are many ways to say walking in Russian. When you walk for exercising reasons, it is ходить пешком. A walk (noun) is прогулка. When you’re on a stroll or walking for enjoyment, it is Гулять. Shashlik is a dish of skewered and grilled meat. Originally, the shaslik is made of lamb but nowadays, beef and pork are used as well. Placed on the skewer are either just meat (one type or variations)or meat and vegetables like bell peppers, tomatoes, onions, and mushroom. You can find the shashlik in Turkey, Middle East, Caucasus, Europe, Central Asia, and the Baltics. The shashlik was introduced in Moscow on the 19th century and became famous in the 20th century. You can enjoy shashliks by buying them from street vendors or while enjoying an outdoor BBQ gathering. Those are the 6 most likeable things for Russian people. Besides loved, Kvass is also a popular drink in St. Petersburg during Ramadan fasting. Other food related article worth checking out are most favourite food in Russia during winter season, best Russian food for party or celebration, and most popular cuisine in Moscow, Russia. Hopefully, you enjoy the dishes and activities in this article just like how Russians enjoy them.